RE YOU INVOLVED in your parish May Crowning? Planning for such festivities falls to a variety of people in different parishes and institutions. In some places, the event is planned directly by the local clergy, while in other places it is the purview of a liturgy planner, youth group, volunteer parent, or music director. Many devotions fell out of favor for a time—Forty Hours, the rosary, novenas, etc. Mercifully, many of these devotions, including the May Crowning, have made and continue to make a strong resurgence. The May Crowning is a beautiful yearly opportunity to renew our love for Mary and to enlist her prayers. A strong devotional life in the parish church will naturally support and strengthen its liturgical vitality. In most situations, preparations for this beloved annual tradition probably begin with a familiar question: What did we do last year? Since the May Crowning is a devotion with no specific, mandated form, that question is a fair place to begin. Some elements are widely incorporated: the presentation of a crown of roses by a selected lady, May poles, prayers seeking Mary’s protection, and hymns sung in honor of the Blessed Virgin. 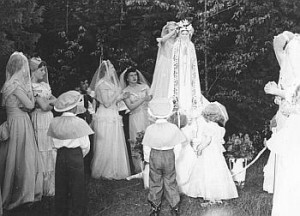 Inasmuch as a May Crowning is not a liturgical occasion, there is great freedom concerning what might constitute the ceremony. There can be songs, flowers, processions, a children’s choir, a litany, a sermon, and other celebratory components. The National Conference of Catholic Bishops (NCCB) published a special volume in 1987, entitled, Order of Crowning an Image of the Blessed Virgin Mary. The title of this document can be misleading. Its purpose is not actually to provide a script for the May Crowning devotion, but rather to furnish a ritual for the one-time coronation of a special Marian statue with a bejeweled gold or silver crown. Ideally, the document envisions that this rite would be carried out by the diocesan bishop, or at least by another deputed bishop or priest. Although the Order of Crowning an Image of the Blessed Virgin Mary does not specifically apply to the annual May Crowning ceremony, it may still serve as a useful resource in planning the yearly parish celebration of Mary. The structure of the rite, and even some of the prayers, readings, & intercessions provided, can serve as a starting point for formulating a parish May Crowning ceremony. Not least among the many aspects of a good May Crowning is the musical dimension. The Order of Crowning suggests the singing of antiphons and hymns, including several Marian chants: Salve Regina, Sub Tuum Praesidium, Ave, Regina Caelorum, Alma Redemptoris Mater, Regina Caeli. American Catholics have a notably strong tradition of vernacular Marian hymns, too, which might well accompany the annual celebration. Building up devotional celebrations and celebrating them well is an easy way for the parish church to foster greater love among its parishioners for Jesus, Mary, the Eucharist, and the Church universal.